The SM1101 from Swiss Mountaineer is a simple yet sharp looking wrist watch for men who want the timeless quality that can only be had in one of the watches of Switzerland. 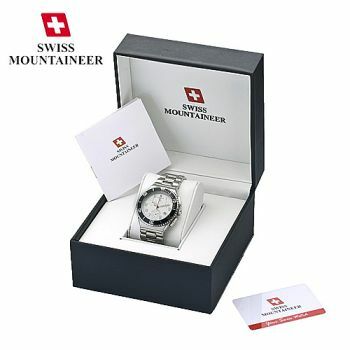 Swiss made watches are known for their quality and workmanship just as the army knives, which also bear the Swiss name, embody the same characteristics. This stainless steel watchcase and bracelet perfectly frame a white watch face that looks great on just about any man no matter what his personal style is. This model is one of the best values around for a Swiss chronograph watch from a top manufacturer of luxury Swiss watches.